US President George W Bush has explained the credit crunch savaging US financial markets by saying "Wall Street got drunk". "It got drunk and now it's got a hangover," Mr Bush said at a private political fundraiser in Houston, Texas. Members of the media were not invited and the audience had been asked to turn off their cameras. But somebody recorded the statement on a mobile phone video camera and it was posted on the internet. The comment was made on Friday and by Tuesday had found its way on to the internet. "The question is, how long will it sober up and not try to do all these fancy financial instruments?" the president asks in the clip. The White House has issued a more prosaic explanation of his comments. "He has said before that Wall Street was dealing with very complex financial instruments and that the markets didn't fully understand the risks that those instruments posed to the system," said spokeswoman Dana Perino. "It is certainly a more colourful way of saying what he said before, but he's described it that way before in terms of his observations of what happened to the market," she said. Financial markets in the US and across the world have been thrown into turmoil as banks have discovered that many American home owners cannot afford to repay the mortgages that have been collected into complex bundles sold in stock markets. The revelations have fed into panic in world financial markets that have led to sharp falls in share prices and a reluctance among banks to lend money - the credit crunch. "We've got a housing issue. "Not in Houston, evidently not in Dallas, because Laura's over there trying to buy a house today," he says to the crowd's laughter. 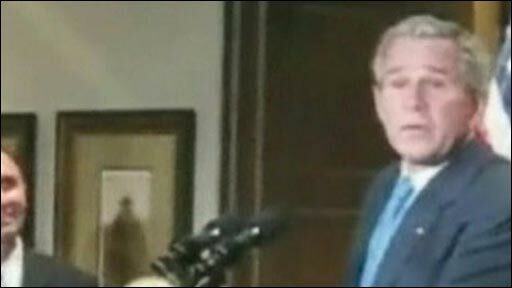 Mr Bush said they were looking for somewhere to live when they leave Washington, DC, as Mrs Bush no longer wanted to live on their ranch in Crawford, Texas.